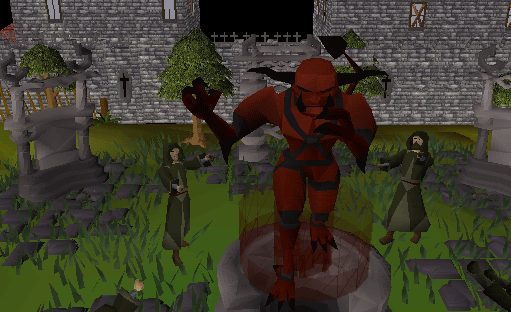 If you are looking for the modern RuneScape guide for this content, please see our Demon Slayer guide. 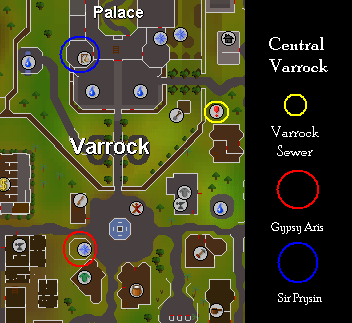 First off, visit the Gypsy in the city of Varrock. 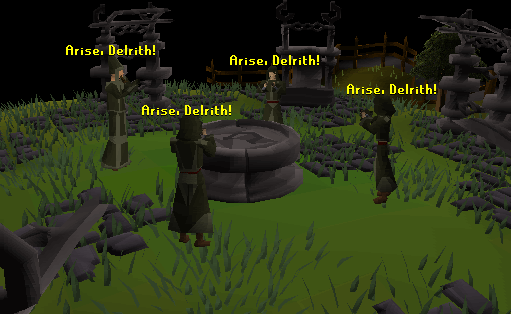 Dark wizards gathered in beneath Varrock to summon the Delrith, a vicious monster that they hoped would render Varrock into rubble. Luckily, Wally, the hero, came just in time. 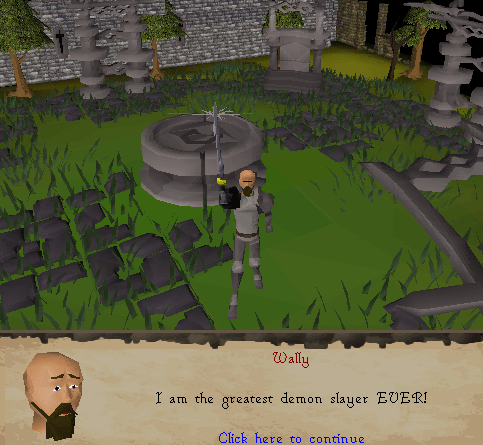 And our (humble) hero managed to defeat the Demon and bind him within the stone Circle that we see now below Varrock. Ask how you can kill the demon, and she says that you need a Silverlight Sword and an incantation -- be sure to write down the incantation that she gives you (it's different for everyone)! She tells you to talk to Sir Prysin about the sword. Sir Prysin can be found in a small room on the west side of Varrock Castle (blue circle on the map). He tends to wander out of this room, however, so be warned. At first he is surprised when you mention the Delrith. After you explain about Gypsy Aris’ premonition, he understands the city’s plight. Unfortunately, he says that he has the Silverlight, but he needs 3 keys to open the box. He says that Captain Rovin has a key, and tells you where he is. Climb two sets of stairs in the northwest corner of the castle to find him, and tell him that it's important that you speak to him. Captain Rovin is at first mistrusting of you. After a bit of arguing however, he finally gives in and lets you have the key. Sir Prysin also said that he had a key, but dropped it down the kitchen drain. Go back downstairs and head to the kitchen in the northeast corner of the castle. You will see a drain there. You see the key, but you can’t reach it. You’re going to have to get it below, but you have to wash it down first. 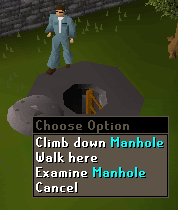 Use the bucket of water you should have in your inventory with the drain just outside the kitchen door to wash the key into the Varrock Sewer. If you don't have one, you can go up the stairs, and pick up a bucket from either of the rooms, and then fill it with water from the kitchen sink. The entrance to the sewer is just east of the castle fountain area manhole (yellow circle on the map), so climb down the manhole. Take the red path to a small room, and the key should be on the ground, surrounded by corpses. Just click on it and you'll get a rusty Silverlight Key. 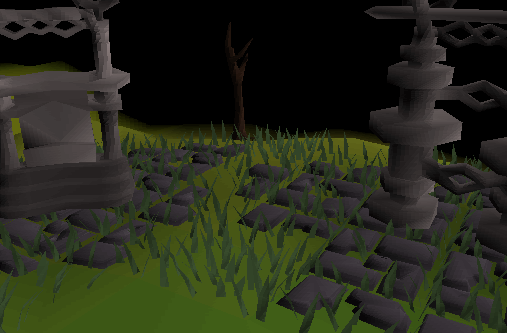 The last key is with Wizard Traiborn, located on the second floor of the Wizard's Tower, just south of Draynor Village. Tell him that you need Sir Prysin's key, and then ask him if he has any keys around. He is totally confused. He finally remembers a key, but he needs 25 bones to perform a ritual to open the box that it's in. You can kill the wizards in the tower to collect bones, but a quicker way to obtain them would be to kill chickens. 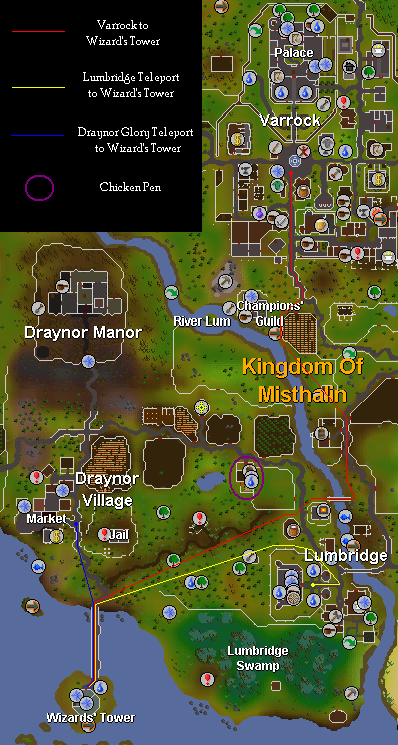 There's a farm east of Draynor Village (blue circle on the map). You can give him the bones gradually. In other words, you don't have to give all 25 bones at once. However, it quicker to do it all at once if you are killing chickens for them. When you give him all the bones, a very short mini-cut scene will ensue where he performs the ritual and a wardrobe will rise from the floor. He will take his Silverlight Key out and give it to you. Once you have all 3 keys, go back to Sir Prysin. Another very small mini-cut scene will happen as he opens the box and gives the Silverlight to you, and which you then brandish about for a bit. Tip: If you drop your Silverlight and talk to Sir Prysin, he will give you another sword. 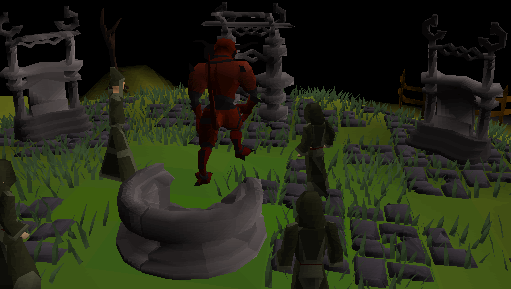 This way, you could have an extra in case you lose your sword after the quest, instead of having to buy one for 500gp later on. 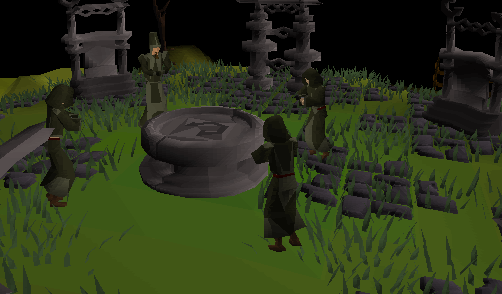 Once you have all your combat equipment and food ready, head to the Stone Circle just south of Varrock. Once you get within close proximity of the circle, a big cut scene starts. You see three dark wizards and a wizard called Denath. All the Dark Wizards begin to chant. They finally summon the supremely evil Demon. This might be the end for Varrock! But you arrive just in time! When you enter the circle, a wizard will start attacking you, so you will have to kill it and go to the Delrith. Or, you can wait until all the Dark Wizards are facing away from you and the Delrith is close to you and then run to him. With your Silverlight equipped, attack the Demon until he is in a weakened state. When he is in this state, pick the right incantation (refer to the incantation you wrote down earlier) and finish off the foul Demon. Collect bucket of water and 1 gp, talk to Gypsy, write down incantation. Talk to Sir Prysin in Varrock Castle. Get the 1st key from Capt. Rovin, 3rd floor northwest corner. Head through the kitchen to the drain outside and flush with bucket of water. 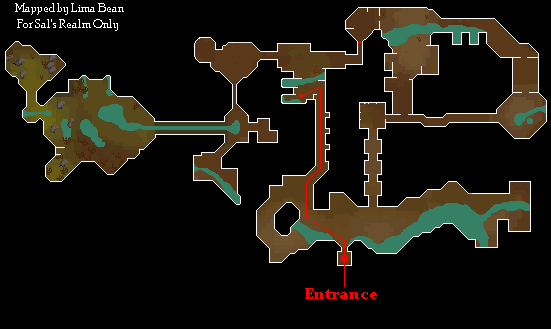 Head for entrance Varrock Dungeon, enter and take western corridor. Collect 2nd key. 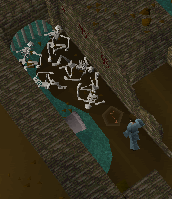 Withdraw 25 normal bones from bank and head towards the Wizard Tower. Get the 3rd key from Wizzard Traiborn on the 3rd floor. Back to Varrock, withdraw other keys and talk to Sir Prysin to get Silver Light. 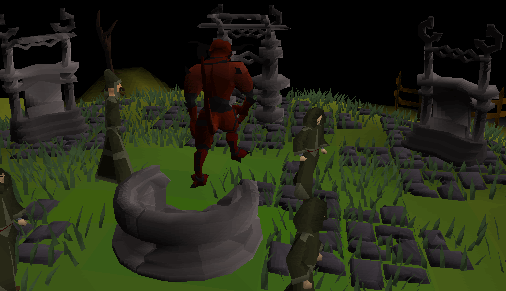 Head south of Varrock and enter Stone Circle. Fight demon and use incantation to vanquish him.